"Tardies last year totaled 6,773 for the first Trimester alone. If each tardy is three minutes that means that 20,319 minutes of instruction were lost in the first Trimester. 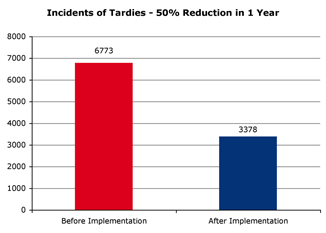 Comparing last year�s first Trimester total tardies to this year, results indicate a decrease of 50 percent. Because of the �start on time� interventions, it was estimated that 10,134 minutes of instruction have been recaptured." 90% of students qualify for the Free/Reduced Lunch Program. 6% of students receive Special Education Services. Students and staff at Hamilton Middle School have reduced tardies by 50% and recovered 10,134 instructional minutes during the first trimester of the first year of START on Time!